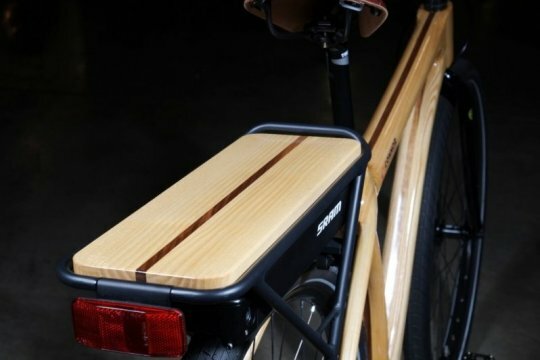 How is this for custom electric bikes: an e-BBQ-bike with refreshment carrying capacity, a wooden frame e-bike, a bamboo frame e-bike, and more! Those types of e-bikes are the result of a challenge that Gates Carbon Drive put forth to some custom frame builders for the North American Handmade Bicycle Show. 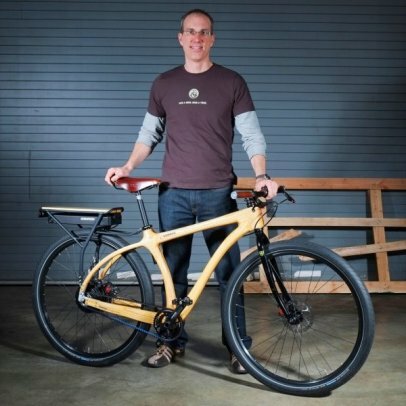 The builders had to incorporate the Gates belt drive with the SRAM E-Matic e-bike system to create a unique e-bike. And yes, they are unique! The SRAM E-Matic e-bike system features a rear hub motor with a torque sensor. The rear motor hub has a 2 speed system that automatically shifts into a higher gear based on the speed you are going. The SRAM E-Matic a very clean and simple system because it is a rear hub motor with a rear rack battery and there is no display on the handlebar. 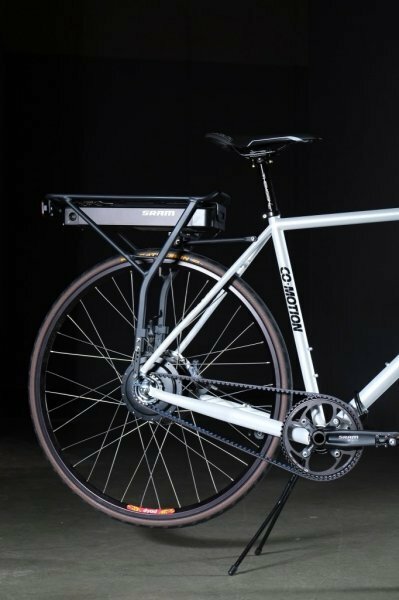 It has minimal wires that are hidden well in the rear rack. Likewise the Gates belt drive is very simple and clean. You never have to oil it, so it keeps you pant legs clean. Gates also challenged some builders to assemble custom e-bikes with the Bosch/Gates/NuVinci combination as well as the BionX/Gates combination. 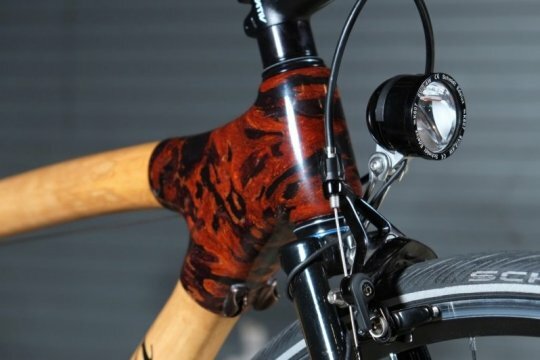 Enough chit chat, let’s checkout these custom SRAM/Gates e-bikes! 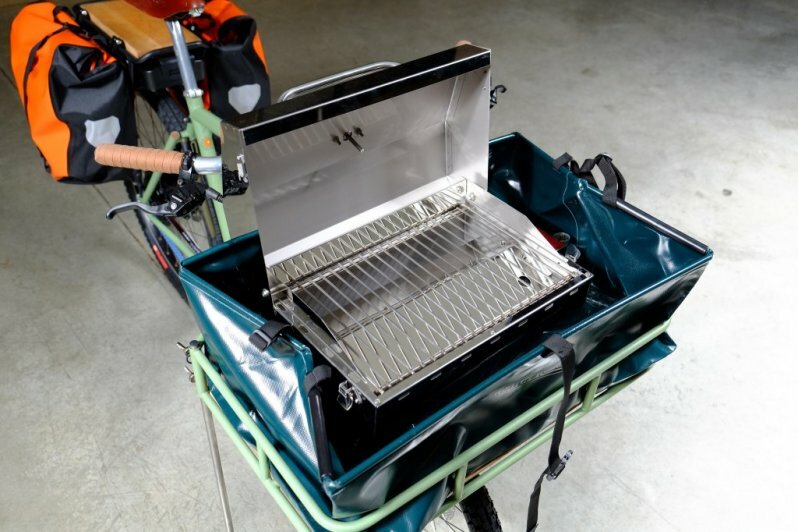 This is an electric bike with a mobile BBQ built in! Jeremy Sycip of Sycip Designs from Portland OR, created this e-BBQ-bike with the SRAM E-Matic system and the Gates Carbon belt drive. 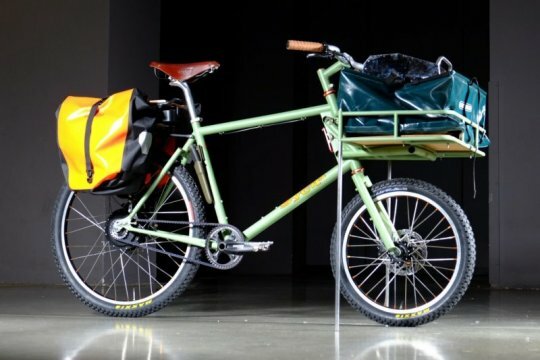 Yes, this bike will probably be the hit of any party! You could probably build a business around this bike….. 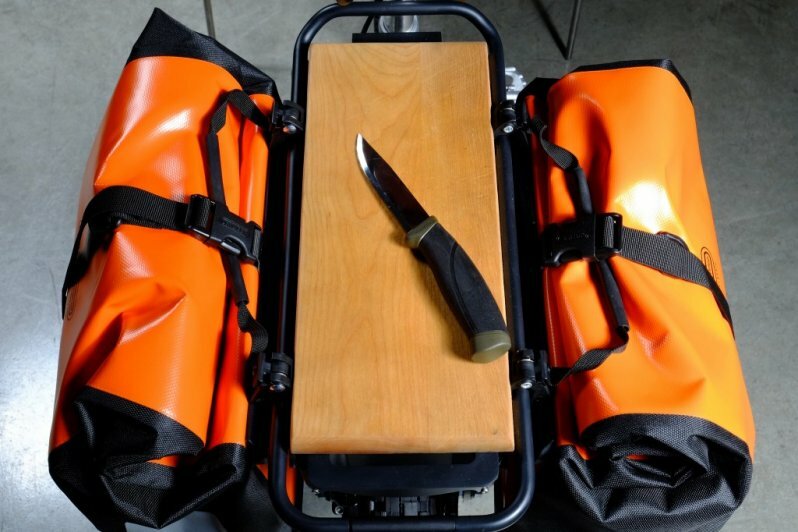 The rear rack features a cutting board and there is a knife holder and bottle opener built into the frame. The panniers can store your beer, sodas, and ice! 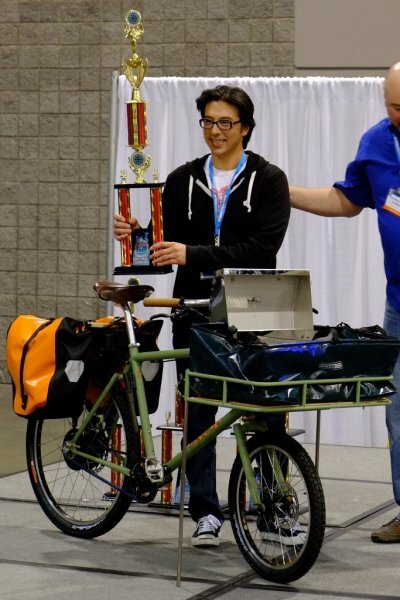 It is no surprise that the e-BBQ-bike won the North American Handmade Bicycle Show award for Best Theme Bike. 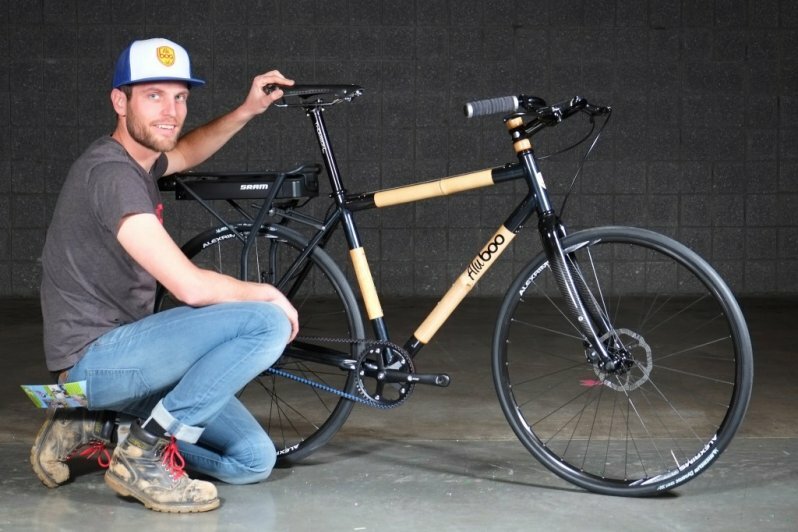 Next up is the el Woody electric bike from Connor Wood Cycles from the Denver CO area. Chris Connor was a guitar maker and now builds these beautiful wood bike frames. His bikes have been proven to be tough as one was raced in last year’s Leadville 100 mile mountain bike race. The SRAM E-Matic and Gates belt keep this bike looking clean! Note the wood top plate above the SRAM E-Matic battery rack…….classy! 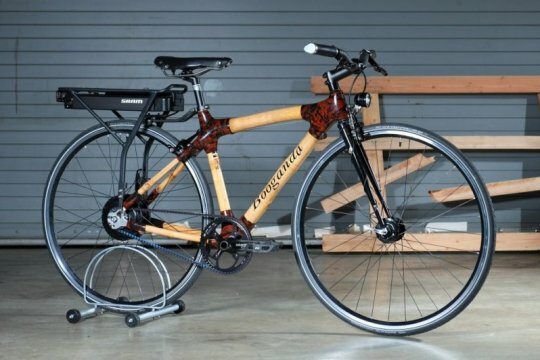 Now, how about a bamboo bike frame?! Craig Calfee built this Booganda bamboo frame e-bike to show off what can be done with this renewable material. Craig is known for his efforts to teach people in developing countries how to use bamboo to create affordable and clean transportation. 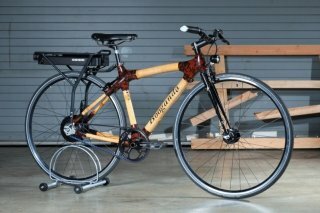 It is surprising what can be done with bamboo! Speaking of bamboo frames, here is the Boo Cycles AluBoo frame. 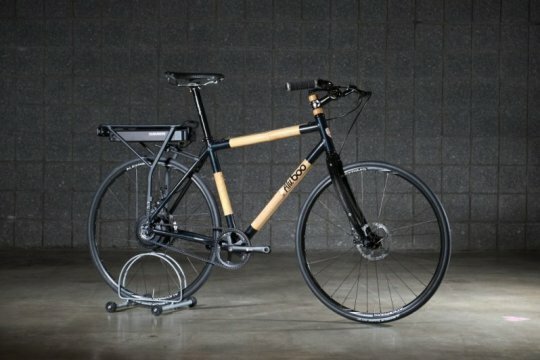 It combines an aluminum and bamboo frame with a carbon fiber fork. The SRAM E-Matic system and Gates belt drive round out this urban commuting machine. 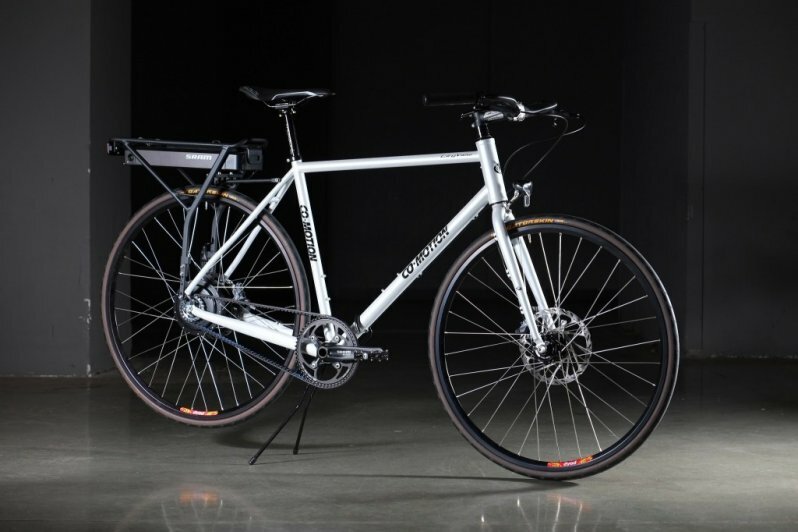 Co-Motion Cycles from Eugene, OR showed off their CityView commuter style e-bike. This is an e-bike with a custom steel frame. Looking clean! The SRAM E-Matic system conceals the wires between the motor and battery well. And the Gates belt drive is oil and dirt free. That’s a wrap of the SRAM E-Matic/Gates Carbon Drive custom electric bikes from the Gates E-Bike Showcase at the North American Handmade Bicycle Show. Make sure you checkout the Bosch/Gates/NuVinci custom electric bikes as well as the BionX/Gates combination. Stay tuned for more of the custom e-bikes with the BionX/Gates drivetrains. I saw these E-Bikes at the NAHBS show in Charlotte NC. They were the hit of the show. The builders have a lot of talent. Hopefully the E-bikes at the show will become an annual event. Thanks to the NAHBS, Gates and the E-Bike component suppliers for making this possible.